Epicor ERP offers flexible, industry-specific enterprise resource planning solutions that are designed around the specific needs of manufacturing customers. The solutions leverage new technologies such as the Internet of Things (IoT), social collaboration, big data and analytics, 3D design automation, and mobility for a combination of rich global functionality built on agile technology. Epicor ERP capabilities include a CRM for managing customer and partner data, invoices, quotes, orders, multi-level pricing contracts, and more. Tools for performance management provide visibility into the business, allowing users to plan, execute, and analyze at both strategic and tactical levels using business intelligence (BI) data. Users can securely capture, store, manage, and access content and documents at any time, via any device, using Epicor’s content management system (DocStar), empowering interdepartmental collaboration. Organizations are able to manage and streamline financial operations and gain insights into performance, expense, and risk through tools and controls to support complex legislative requirements. Features for planning and scheduling provide day-to-day control and long range planning, helping to manage supply and demand in real time with resource optimization, availability, change management, and more. Epicor ERP’s tools for manufacturing and production provide a full range of supply chain management, execution and distribution capabilities. Epicor ERP helps organizations plan and execute simple or complex, multi-level projects with strict costing and billing through features for project planning, time and expense management, billing and revenue, and resource management. Users are able to maximize service effectiveness by coordinating service center processes, and managing each aspect of the supply chain from forecasting to fulfillment. Epicor ERP also includes human capital management from onboarding, to talent management. Epicor ERP is the lifeblood of our company. It has all the transactional records and ensures items are produced, delivered, and invoiced efficiently. Requires a large up-front investment of time and energy to get set up, but once it has gone LIVE, you won't be able to imagine running your business without it.Epicor ERP is an all-in-one solution for medium-sized manufacturers. It covers everything needed and has lots of optional modules. We use it for: Quoting Orders Jobs/BOMs Product Configurator Dashboards Reports Purchasing Inventory Production AP & AR invoicing The Epicor team has worked hard to improve the software over the years, and it is now 100% Microsoft Stack. The SQL database can be queried from within the software using reports and dashboards, or externally using Business Intelligence software such as Power BI or Tableau. The price point is better compared to some of its larger competitors in the ERP space. If you have less than 200 users, Epicor will be a much more cost-effective ERP than the ERP leaders. The opportunities for customisation and personalisation are very high. Epicor ERP is an all-in-one solution for medium-sized manufacturers. It covers everything needed and has lots of optional modules. We use it for: Quoting Orders Jobs/BOMs Product Configurator Dashboards Reports Purchasing Inventory Production AP & AR invoicing The Epicor team has worked hard to improve the software over the years, and it is now 100% Microsoft Stack. The SQL database can be queried from within the software using reports and dashboards, or externally using Business Intelligence software such as Power BI or Tableau. The price point is better compared to some of its larger competitors in the ERP space. If you have less than 200 users, Epicor will be a much more cost-effective ERP than the ERP leaders. The opportunities for customisation and personalisation are very high. Earlier versions of Epicor ERP were slow and clunky, but the new version is really fast. Also, you need experts to help you implement the software, and a dedicated team to maintain it. This is not an "out of the box" solution. It requires you to map your business processes and then implement the software carefully to suit the way your business works. You can customise almost anything you want in the system, but greater customisation brings with it added complexity and possible issues when upgrading point releases and versions. Great for Tracking Manufacturing Costs, Managing Schedules, and Controlling Inventory! I've spent 15 years with Epicor ERP products (including their former ERP product, Vista), from full implementation to training and running / maintaining over the years. I absolutely LOVE Epicor ERP, as I lived in it for such a long time and saw it meet the needs of an extremely challenging manufacturing environment! My experience with Epicor support has been very positive as well.Epicor ERP is an exceptional software product for manufacturing environments! It's strongest points are Inventory Control (Including perpetual inventory tracking and extensive Bill of Materials functionality), Manufacturing Routing and Scheduling, and Job Costing. It also does a good job at Quote and Order Management, and standard accounting (AR, AP, GL's etc). The UI itself, while very expansive, is easy to navigate and laid out very logically. The MES (shop floor) module is also fairly straight-forward to use for the production employees. The software offers some great tools like their BAQ feature (Business Activity Queries), which allows extensive SQL Queries to be designed and used within the UI without having to have SQL scripting / programming knowledge. The entire UI also has a "field help" feature, which allows you to access table names, field names, and field function info right from within any screen in the UI! For people with SQL and UI knowledge, Epicor ERP offers some really good customization features as well! If Inventory, Scheduling, Job Costing and Quote/Order Management are your biggest priorities, I'm of the opinion that Epicor ERP is the BEST choice out there! Epicor ERP is an exceptional software product for manufacturing environments! It's strongest points are Inventory Control (Including perpetual inventory tracking and extensive Bill of Materials functionality), Manufacturing Routing and Scheduling, and Job Costing. It also does a good job at Quote and Order Management, and standard accounting (AR, AP, GL's etc). The UI itself, while very expansive, is easy to navigate and laid out very logically. The MES (shop floor) module is also fairly straight-forward to use for the production employees. The software offers some great tools like their BAQ feature (Business Activity Queries), which allows extensive SQL Queries to be designed and used within the UI without having to have SQL scripting / programming knowledge. The entire UI also has a "field help" feature, which allows you to access table names, field names, and field function info right from within any screen in the UI! For people with SQL and UI knowledge, Epicor ERP offers some really good customization features as well! If Inventory, Scheduling, Job Costing and Quote/Order Management are your biggest priorities, I'm of the opinion that Epicor ERP is the BEST choice out there! There are a LOT of options throughout the system, including areas like scheduling and costing. These settings and options can be overwhelming for sure, so it's critical to have a solid team of power users who have a good understanding of options and how things work! I would like to see Epicor ERP have a few more integration features, such as email and calendar integrations. Overall great experience it in terms of scalability, customization, and providing business needs. I learned how to create SSRS reports. I learned how to customize different menu items using the wide variety of customization tools. I learned how to query data and transform them in many different ways to present accurate reports. I learned how to use the many menu items and modify them to our business needs. I learned how to develop business process flows for our company to reference whether it's entering an order, tracking an order, creating a job, etc. I learned how to troubleshoot errors that arise. I learned how to identify what causes errors within the software. I learned how to map out what what each menu item is used for. Overall it is a great learning experience and there is much more to learn from this software and I am grateful for having to work with this software.I mostly like the ease of use of this software. Data entry and Data queries are easy to do with the many screens provided in this software. One thing to mention is the powerful search function to find different screens, displays their path within this software so that is also a big plus. Another positive is the overall navigation of this software with the different modules feels natural because of the 'tree view' option for the menu items. The different maintenance screens are set up pretty nicely and can be customized depending on what type of SaaS option you have so that is great as well. I also really like the security settings I can adjust to prevent users from accessing certain screens or hiding certain fields from them. One final mention for this section would have to be the SSRS integration. I design lots of reports and it is extremely easy to pull data into an SSRS report and present them how I want it. I mostly like the ease of use of this software. Data entry and Data queries are easy to do with the many screens provided in this software. One thing to mention is the powerful search function to find different screens, displays their path within this software so that is also a big plus. Another positive is the overall navigation of this software with the different modules feels natural because of the 'tree view' option for the menu items. The different maintenance screens are set up pretty nicely and can be customized depending on what type of SaaS option you have so that is great as well. I also really like the security settings I can adjust to prevent users from accessing certain screens or hiding certain fields from them. One final mention for this section would have to be the SSRS integration. I design lots of reports and it is extremely easy to pull data into an SSRS report and present them how I want it. Of all the pros that I have listed in the previous section, there are some cons to mention as well. One mention that I like least about this software is the optimization of this software. Many screens take at least 2 minute to open and that is with the recommended hardware specs provided. Another mention is that the PDF reports take at least 2 minute or more to view. I know that the reports are server side and I don't know the process flow of it but it would be nice to click the print preview button and 3 seconds later, have the report show. Increased profitability, and the best record keeping ability I have seen in any software to date. I am confident I can get whatever my customer needs in less time than any competitor, especially if it isn't in stock. I can and do recommend this software, and I am involved with a number of user groups, IT groups, and machining groups who are always asking what we use and how we keep it functional.This software allows a quoter to include every facet of a project before it gets a customer PO. From that quote, every detail is able to be brought through to the order, the job, the packing slip, and the final invoice. There are so many different ways to track various phases of the project as it moves through. Every detail can be recorded if every employee is disciplined enough to make the input. Then, 10 years from now, when the machine finally has a hiccup, (and assuming everyone entered all the details) you know every purchased part and have a link to every drawing used in manufacturing. Your customer will be amazed when you can recite those part numbers and pull prints within minutes 10 years later with absolute accuracy. You will eliminate QuickBooks, sales force or any other CRM, MS Project, and a host of programs that are not integrated and require multiple entries once you are fully functional. This software will transform your company, and you will become more profitable than you were before. Your work week will never be under 50 hours again, and you will either learn very facet of the software of spend well over 100k every year to keep it running, but if you stay on every employee all the time to do their best and do YOUR best, you will realize some incredible benefits. Our company does more with 20 people than many companies do with 50, and we manufacture parts and machinery. We can credit a lot of that success to the Epicor ERP system. This software allows a quoter to include every facet of a project before it gets a customer PO. From that quote, every detail is able to be brought through to the order, the job, the packing slip, and the final invoice. There are so many different ways to track various phases of the project as it moves through. Every detail can be recorded if every employee is disciplined enough to make the input. Then, 10 years from now, when the machine finally has a hiccup, (and assuming everyone entered all the details) you know every purchased part and have a link to every drawing used in manufacturing. Your customer will be amazed when you can recite those part numbers and pull prints within minutes 10 years later with absolute accuracy. You will eliminate QuickBooks, sales force or any other CRM, MS Project, and a host of programs that are not integrated and require multiple entries once you are fully functional. This software will transform your company, and you will become more profitable than you were before. Your work week will never be under 50 hours again, and you will either learn very facet of the software of spend well over 100k every year to keep it running, but if you stay on every employee all the time to do their best and do YOUR best, you will realize some incredible benefits. Our company does more with 20 people than many companies do with 50, and we manufacture parts and machinery. We can credit a lot of that success to the Epicor ERP system. There are a few Caveats. There is no way you can employ a single person who is not college educated. Without math skills, great writing and data entry skills, and an exceptional amount of discipline, you will not get the quality inputs, and the software will not be able to give quality outputs. Slowly, over a period of about 3-5 years, you will come to the realization that people just cant come up to the level of inputting the information correctly, and you will have to decide if you want this software to work and be useful of if you want to eliminate these people. There is no other way, it simply cant work. Garbage in - Garbage out. The complexity of the entire computer industry has taken the decision that they are going to complicate every facet that they can to require you to hire consultants to do what for 20 years you could easily do yourself. Continual updates, incredibly complicated reporting that an average person used to be able to do, and a constant push to the cloud really get in the way of helping your customers at every turn. It is almost as if, as a machine shop in our case, your mission is to configure software all day and never deliver a single project. The pros outweigh the cons, but the cost of ownership and value of the effort put into keeping the software functional was less than 10% in 1996-2010 than it is today. If our company was looking at this software today, I really don't know if it would be possible to justify it. The software is not at all user friendly. Little if any documentation on how to use the product. Education is available but pricey. Support system is totally ineffectual and support personal are lacking in basic knowledge. Company has built many silos and employees do not have the ability to see across those barriers. The online support system called Epicare has added a layer of difficulty in that you cannot speak with an employee to explain an issue. The online submission is often limited to drop down selections that have nothing to do with the problem. The helpful tips you are given when submitting a case are almost always way off topic and of no use. Contact Epicor for detailed pricing information. Epicor ERP allows the integration of new technologies and processes in order to help make accurate, data-driven decisions. Get a clear line of sight on everything from product and design through manufacturing and fulfillment to ensure that products will be profitable. Cloud-ready Epicor ERP enables users to access business intelligence (BI) dashboards from any device. Mitigate risk with greater visibility and closer collaboration across the entire supply chain. Drive efficiency and productivity with tools that help better plan resources, balance and distribute work, collaborate with suppliers, and respond to shifting demand. Below are some frequently asked questions for Epicor ERP. Q. What type of pricing plans does Epicor ERP offer? Q. Who are the typical users of Epicor ERP? Q. What languages does Epicor ERP support? Q. 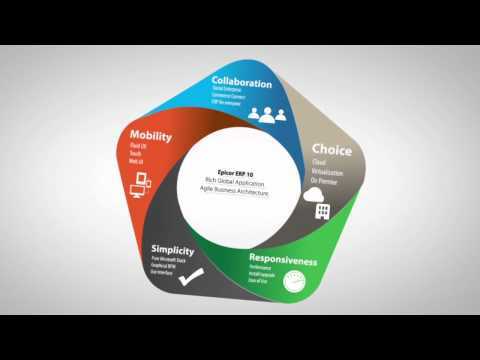 Does Epicor ERP support mobile devices? Q. Does Epicor ERP offer an API? No, Epicor ERP does not have an API available. Q. What other apps does Epicor ERP integrate with? Q. What level of support does Epicor ERP offer?